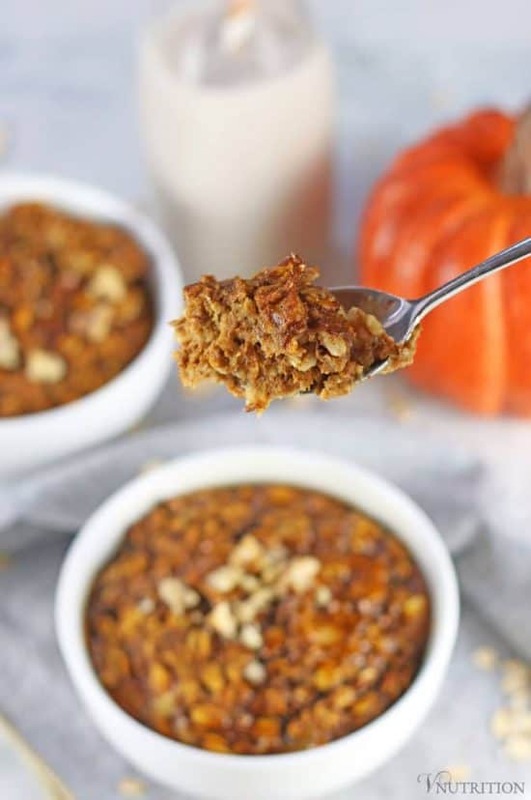 This vegan baked pumpkin oatmeal is a tasty and healthy breakfast option. Full of pumpkin goodness, it’s a perfect for fall or anytime you want a delicious warm breakfast. Yes, I’m one of those “pumpkin people”. As soon as I feel a hint of fall in the air, all I think about is pumpkin; pumpkin pasta, pancakes, lattes, ice cream, pumpkin mac and cheese – basically anything that you can make pumpkin-flavored, I’m in. Who’s with me? 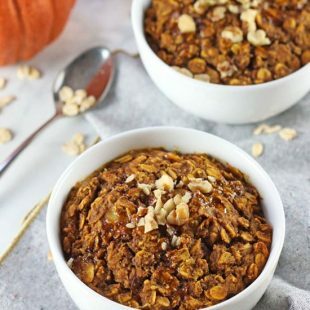 To start off my 3-month pumpkin obsession (it’s only 3 months because the day after Thanksgiving, I’m totally pumpkin-ed out), I’m sharing one of my favorite and simple breakfasts for fall: my vegan baked pumpkin oatmeal. I make this as soon as my pumpkin phase hits (which it has already). And although I still love my smoothie bowls and overnight oats, sometimes I need a warm breakfast on a cool morning. It’s weird how much I like my baked pumpkin oatmeal because I’m actually not the biggest fan of regular oatmeal. I noticed that when I bake it though, I really enjoy it. My friend actually came up with this idea after I was complaining how much I wanted to like regular oatmeal but just couldn’t get over the texture. She said, why not heat the oatmeal in a different way like baking it so it’s more firm? And it worked for me! If you’re not into regular oatmeal either, I hope you try this because it’s more like a cake than oatmeal. When I have extra time in the mornings before work, I’ll mix my ingredients at home and then bring my little bowl of oatmeal to work and bake it in the toaster over so it’s nice and warm. The weeks when I know I’m going to have busy mornings, I’ll bake a few of these puppies Sunday afternoon (usually during halftime of my Dolphin’s game) and then have them ready for the week. They would be great snacks for lunch boxes as well! 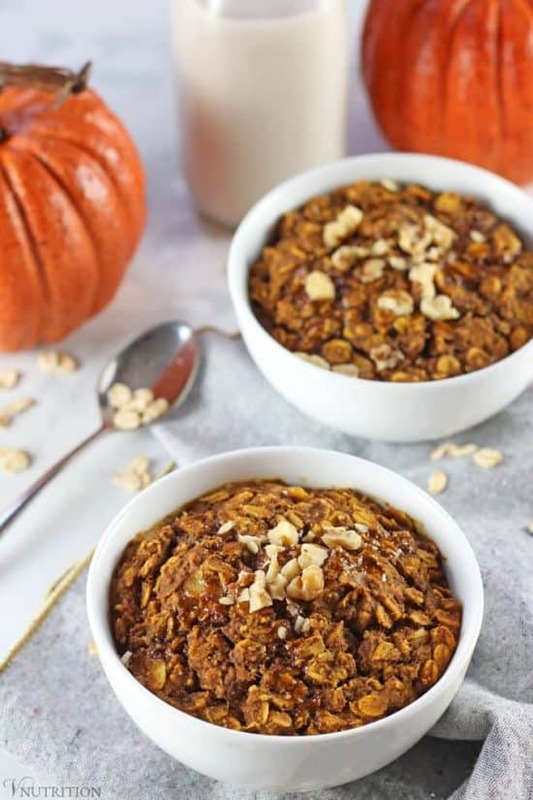 If you make this Baked Pumpkin Oatmeal recipe, let me know what you think by ★ star rating it and leaving a comment below. 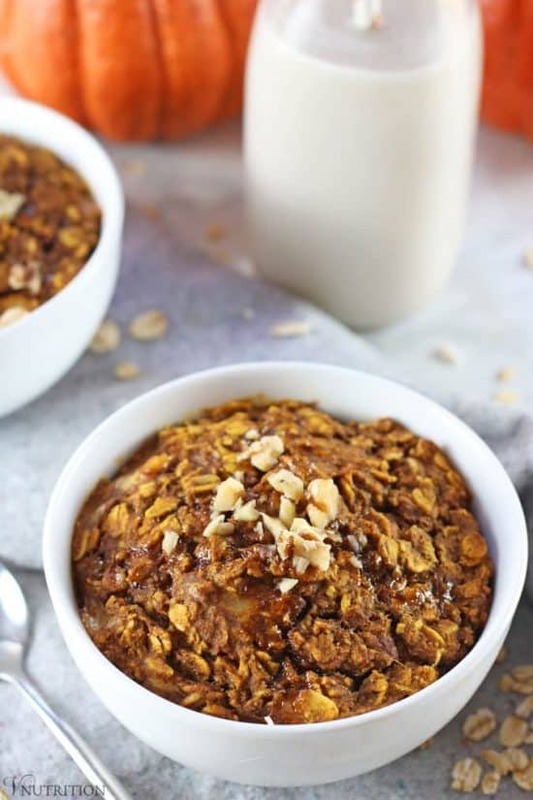 This vegan baked pumpkin oatmeal is a tasty and healthy breakfast option. Full of pumpkin goodness, it’s a perfect for fall! Mix the dry ingredients (through pumpkin pie spice) together in small bowl and then add wet ingredients and mix again. Add mixture to 2 small oven-safe ramekins for smaller portions or 1 larger oven-safe bowl. This sounds and looks so amazing! I’m so excited that Autumn is finally right around the corner and this seems like the perfect recipe to celebrate it! I think I’ll pair it with a nice pumpkin soy latte on Saturday morning. Thank you for sharing this! Thank you so much Kate! Ooh, I need to make a pumpkin soy latte this weekend too! I’m going to figure out how to make one this week so I’m ready for the weekend. I would love it! I know I need to email me you back too! I had 3 papers and 2 presentations due this past weekend and I’m in NYC in meetings today but I’ll email you back this week! I was thinking of trying to come up with my own recipe for my blog soon too but I’d love to try yours! I have some leftover pumpkin from a recipe I just posted on my site and might have to make this with it! Thanks Amy! Let me know if your sister likes it! Thanks! I totally hear you Farrah! I used my toaster oven bc the regular oven would have been way too hot! And sadly I am not a pumpkin fan… it does not like me either. I may try this with sweet potato purée, I bet it would work well. I LOVE the tip to use the toaster oven. That’s just genius. 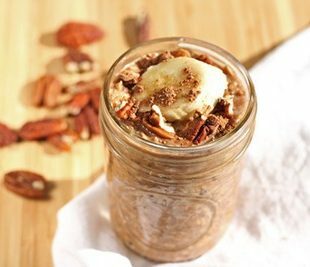 “I’m actually not the biggest fan of regular oatmeal.” So baking it works for you which is cool. Have you thought of adding super yummy ingredients to make it more palatable? I really like adding mashed banana for sweetness and cocao powder and almond butter to make it like a pb & chocolate oat bowl. So good. Haha, I think we only differ in me loving pumpkin and spiciness. 🙂 I used to love summer and hate fall because it got cold but now summers are almost unbearable to me with the heat and humidity here (it’s like Florida in NJ from June-September) so little coolness is a relief. BUT I don’t like it when the temps dip under like 65 degrees – no thank you! That’s a good idea to use sweet potato! If you try it, let me know what you think. I bet it’s tasty! I’ll try adding ingredients to oatmeal when it gets colder and let you know how it goes. It’s more of the texture thing I think. Baking it makes it more like a cake and I like that haha! Thanks for the tips, I’ll give it a shot! I can’t wait to try this oatmeal! Every year I look forward to the pumpkin o’s at Trader Joe’s, but this looks like a much better and healthier breakfast option. I’ve never heard of the pumpkin O’s at Trader Joe’s – I’ll keep an eye out for them! Thanks so much Amy! I am all about the pumpkin, and all about making this the day before so I can quickly heat it up for my kids in the morning. Looks delicious! Perfect breakfast! I’m so excited that fall is almost here! I always preferred “raw oatmeal” the most. Something about it just is tastiest to me. I should give baked oatmeal a try though. What’s raw oatmeal? It is uncooked? It is pretty much soaked oat groats that are tossed in a food processor. I haven’t tried it with rolled oats, since they aren’t “raw.” I am sure the flavor would be slightly different. This sounds like a very cozy start to the day – especially as the mornings get cooler. I’m ready for all things pumpkin! Even though I use it all year – just not a much. This baked oatmeal looks wonderful! Thanks so much Jenn! I’m totally into pumpkin most of the year too (I love Japanese pumpkin all year especially) Sorry I’m just responding to this, for some reason I just saw it! I’m totally with you on this!!! I love pumpkin, but after Thanksgiving it’s all about peppermint lol!! I don’t know what it is, but it’s a requirement to eat pumpkin everything until then lol. Thanks for sharing this, I’m definitely going to make this!! I’m totally a pumpkin person too, so from now until Thanksgiving, I feel like a day is wasted if it’s not filled with pumpkin-y goodness! 😉 I’m also a huge baked oatmeal enthusiast, so this is perfect! 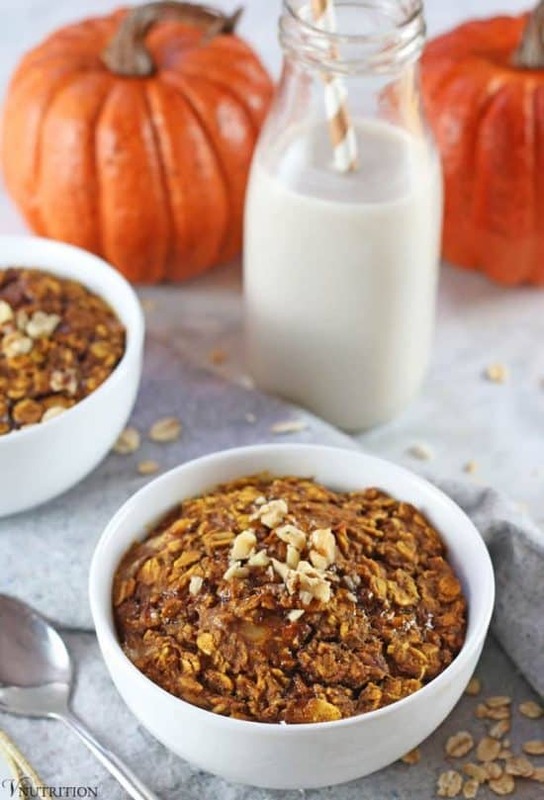 I love baked oatmeal, and it’s perfect timing to start thinking about pumpkin baked! Thanks! I love it so much too! Yes, it was a bit chilly last week here in the morning and this was the perfect breakfast! Yeah, I’m pretty much a smoothie for breakfast too. I only switch it up when things get a little cooler. Let me know if you try it for lunch! Mary Ellen- so raw oatmeal is made mainly oat groats that are soaked overnight then pureed in a food processor. I am not sure why I like it so much more, maybe less slimy/slippery? 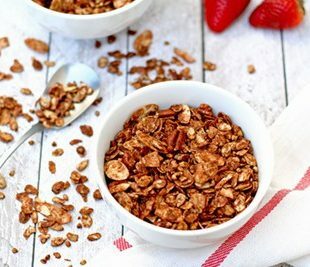 I use to make them during my “raw breakfast phase” and now I just find the groats too pricey. It has been so long since I’ve made it…. but I think this recipe is kind-of close to it? I might have it saved somewhere in my recipe binder. Also sorry if this sent a bunch of times, I tried submitting a reply up above but the comment keeps not showing. Maybe it is going into the spam comments? Who knows. So sorry! This did go to spam and I just saw it now! I think anything with a link goes to spam and I didn’t see that I had anything in my spam folder! I am intrigued by the raw oats. I’m going to give them a try! Ah I see. XD I had a feeling since I wrote a bunch but other people’s were still showing up. I definitely have to make this! Such an inventive recipe! I grew up eating pumpkin all year round and still can’t get into eating it seasonally so although it is spring I am still wanting pumpkin – but I am less into the porridge – went through a phase and sadly I came out the other side! but I love this pumpkin version and maybe will try it when the weather cools again! Thank so much Johanna. We Americans only seem to crave pumpkin in the fall here for some reason. Though I do eat other winter squashes most of the year. Tis the season for oatmeal and pumpkin! This looks absolutely delicious!!! It sure is! Thanks so much Annemarie! What an easy and delicious-looking recipe! Thank you for sharing! This looks so delicious! I’ve made baked pumpkin oatmeal but this looks amazing. 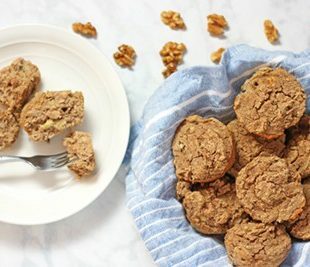 Same ingredients I use in Pumpkin Oatmeal Cookies and I can’t wait to try it! Can’t believe fall is only a few days away. Thank you for linking up with us for Meatless Monday! Thanks so much Sarah! Ooh, I’ll have to check out your pumpkin oatmeal cookies – they sound so tasty! 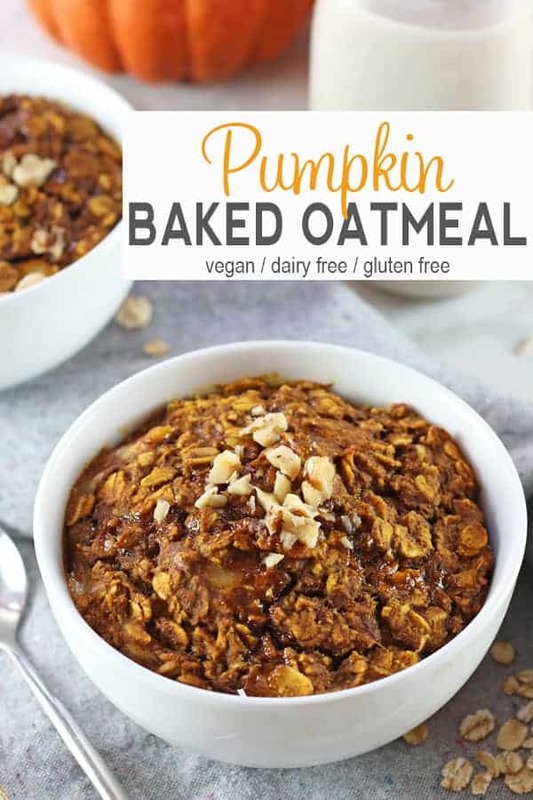 I like oats in all forms and pumpkin so this sounds great 🙂 My main barrier to pumpkin products is laziness as I find it a hassle peeling and cooking them before baking (the tinned variety isn’t common here) but I need to get over that! Long time, no visit – MY BAD! Sorry! 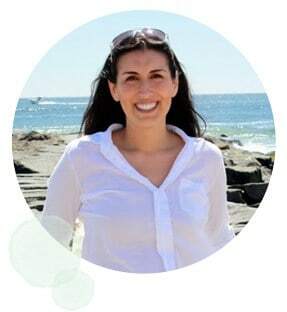 I have you on my blogroll now so hopefully, that won’t happen again! LOVE the pics of this! Delish! Oh my gosh, this sounds so good! I love that it’s something you can pop into the oven to cook while you get ready in the morning.